Crunchy biscuits made with wholegrain oats, barley and honey with a peanut butter flavoured filling. Filling made with real peanut butter. 100% wholegrain oats and barley. High in fibre. No colours or preservatives. No artificial flavours. Suitable for vegetarians. 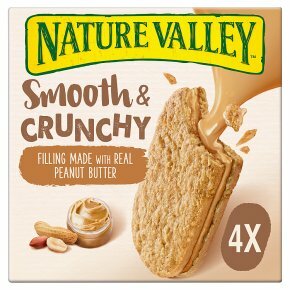 Go ahead, try our Nature Valley Nut Butter Biscuits: two crunchy honey biscuits, made with 100% wholegrain oats and barley, containing a deliciously smooth filling made with Real Peanut butter - the perfect on-the-go companion to start your day!